Thursday was the finale of the series and I left Alex and Jess’ place at 11:15. I got off the red line at noon and made my way down N Sheffield. I stopped at one rooftop establishment and asked them if I could get my game number picture taken in their seating area on the roof. They said it wasn’t possible. I don’t know about that but I understood that they were just following their policies. I tried 3643 N Sheffield and Tim (who was handing out the passes) said yes almost immediately. 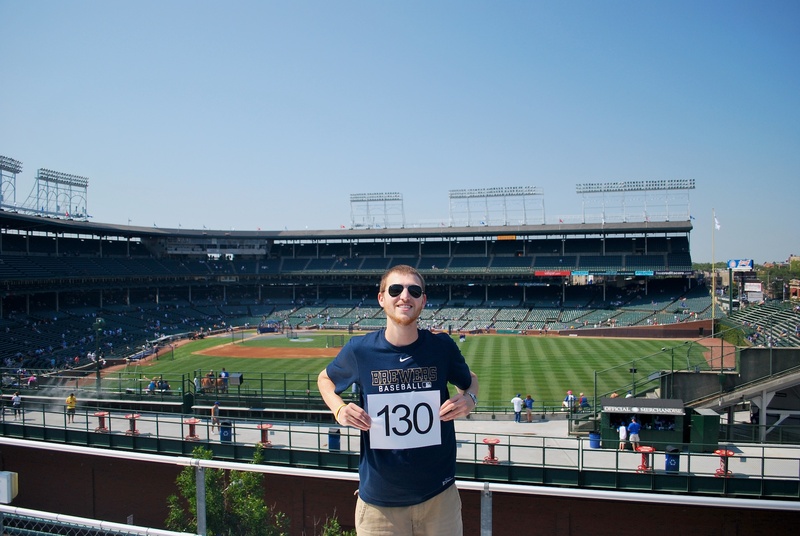 One of the security guys, Bueno, took me up to the rooftop and took game photo number 130 for me. Thanks guys! If you’re interested in ever taking in a game from up here I recommend it. Some of the outfield is not visible, but all you can eat and all you can drink makes up for it. 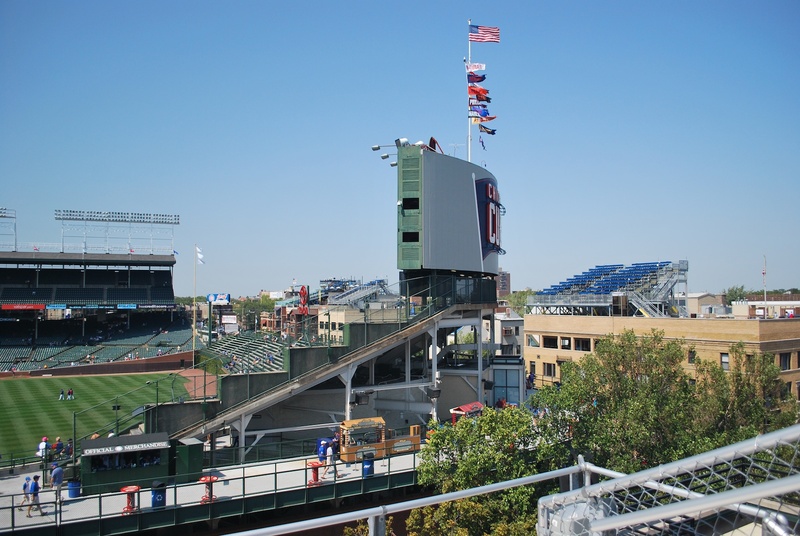 Their website is Wrigleyville Rooftops and they own two other rooftops in addition to the one at 3643. This was the view of the back of the scoreboard. There is also a seating area and a bar on the third floor of the building. 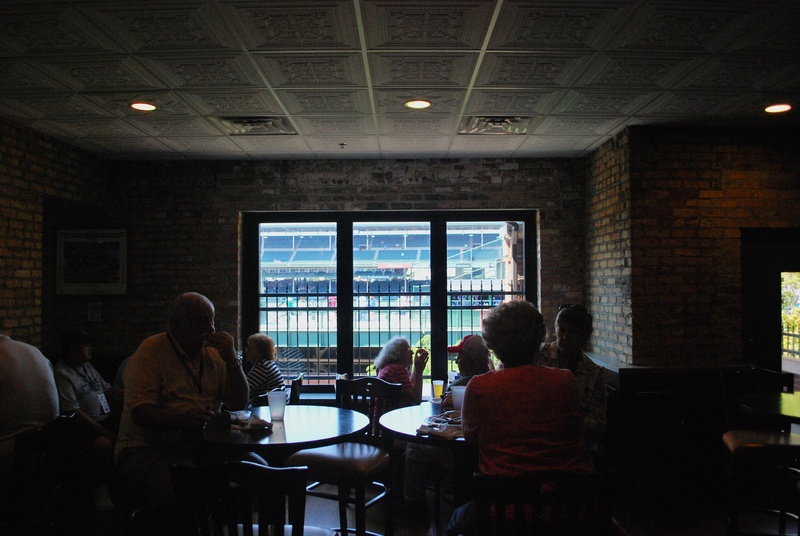 I probably wouldn’t try watching a game from here but it’s a great spot to get your eat on before heading upstairs. 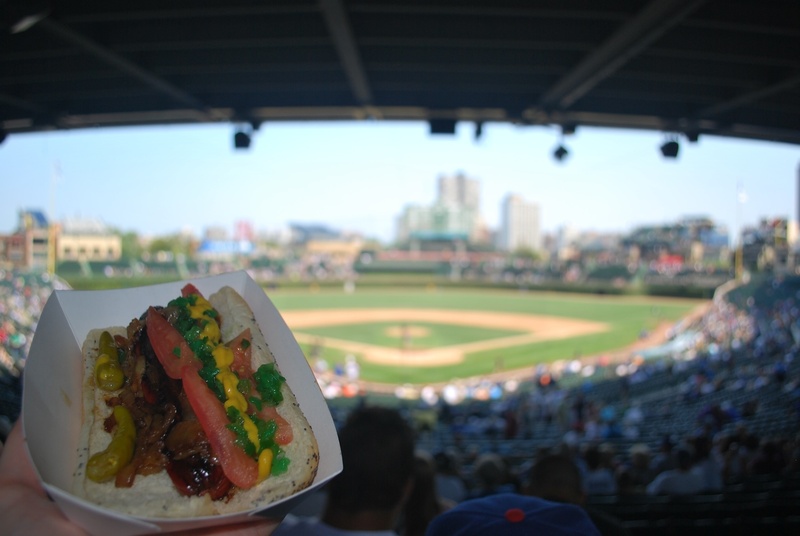 I went downstairs, thanked Tim and Bueno for letting me in and went across the street to Wrigley. On my way around the stadium I stopped to get pictures of the statues that are located in the right field corner. 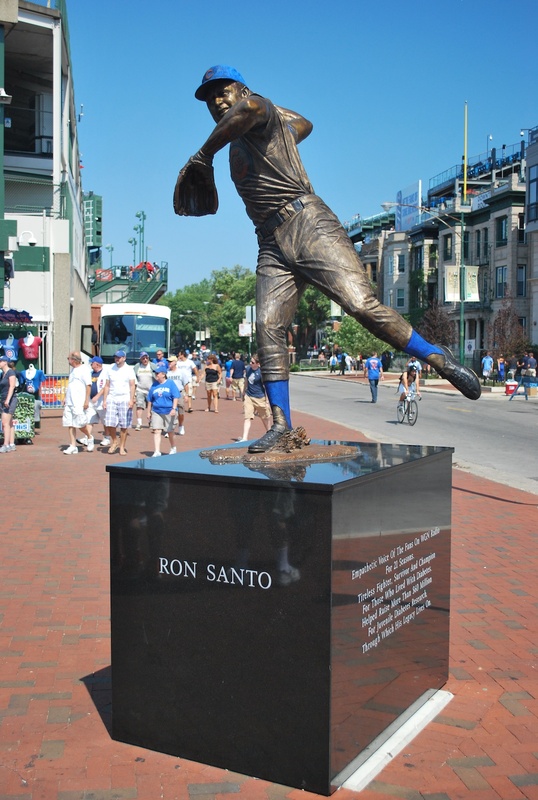 The first is of Ron Santo, who played for the Cubs from 1960-1973, was a nine-time All-Star and won the Gold Glove five times. His number 10 is retired by the Cubs. 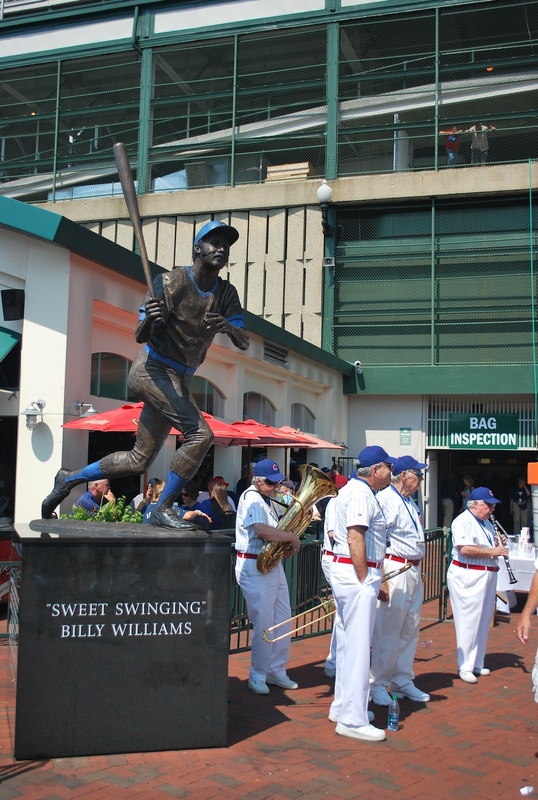 Nearby is a statue of Billy Williams who played for the Cubs from 1959 to 1974. He was a six-time All-Star and also has his number retired by the club. I included the guys with the instruments because I’ve seen them at Wrigley before and I’m hoping somebody will fill me in on their significance. I’m assuming it’s some sort of tradition but I’m not sure when it started or why. I picked up my ticket from player will call, thanks to the Brewers, and was inside by 12:30. I went to my seat in aisle 220 and realized I wasn’t going to be able to make it all game without getting something to eat. I got a Chicago style hot dog and despite the hot dog itself being a little burnt, it hit the spot. The game started at 1:20 when Brooks Raley threw a called strike to Aoki. 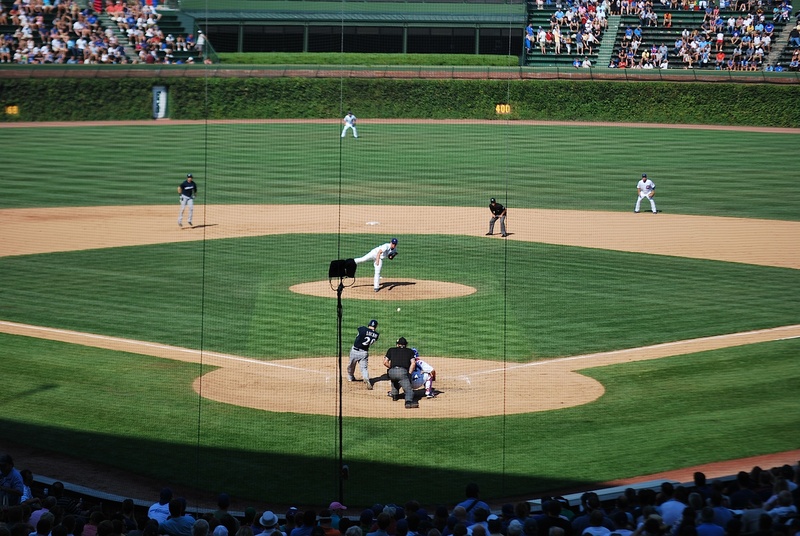 The Cubs scored three runs in the first two innings but the Brewers answered in the 3rd. After an Aoki groundout the next three batters reached base, giving Lucroy the chance to drive in a few runs. I’ll let the next five pictures do the talking. 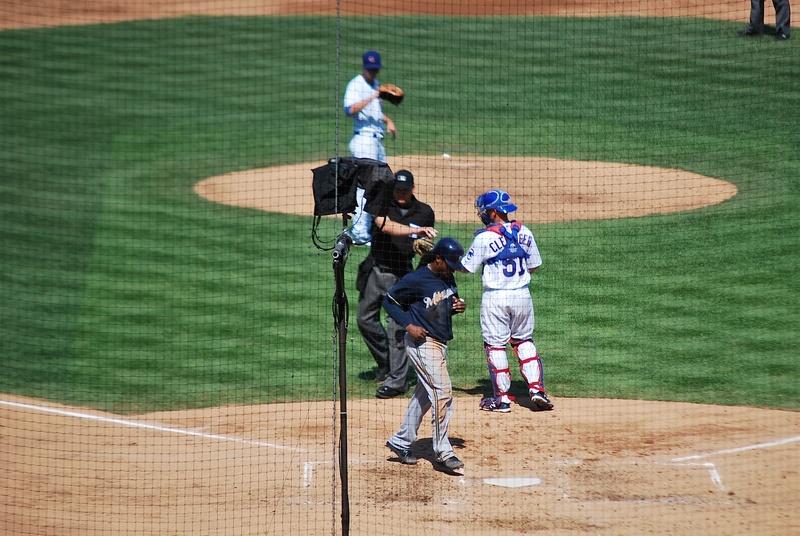 Lucroy had hit the 1-1 pitch out onto Waveland and with the Grand Slam the Brewers took a 4-3 lead. Cody Ransom added an RBI single in the 3rd and the Crew had a two-run advantage. In the top of the 4th Ryan Braun hit “an absolute bomb” off of the centerfield camera hut, a 460-foot blast according to hit tracker online. 7-3 Brewers. 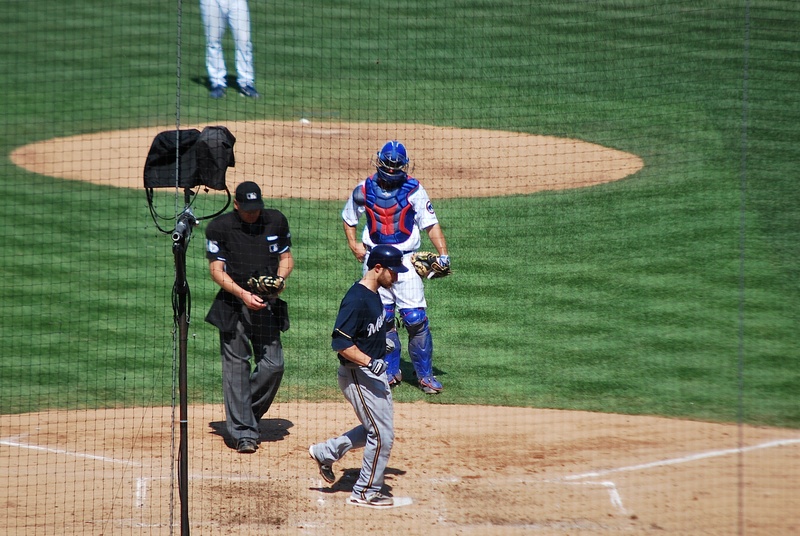 With two outs in the top of the 6th Lucroy singled home two more runs, giving him 6 RBI on the afternoon. 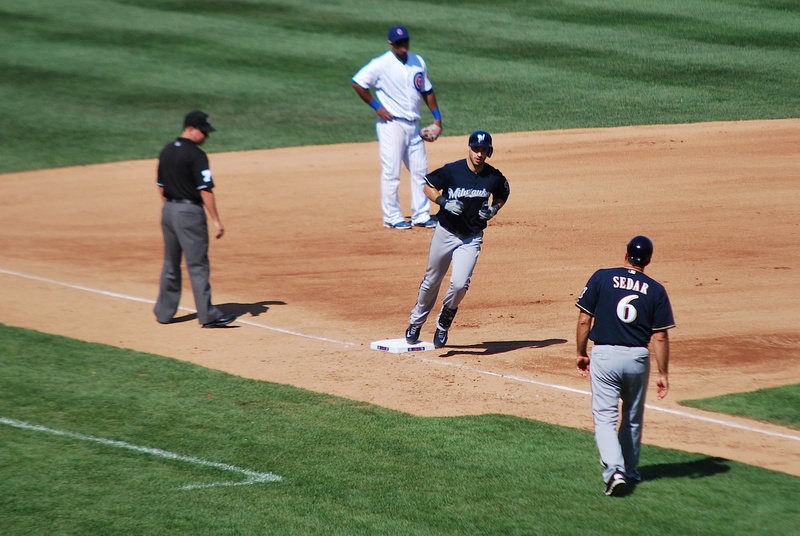 I like that Braun is airborne out there at second base. The 9-3 lead didn’t last long as the Cubs scored six runs in their half of the 6th. Ugh. 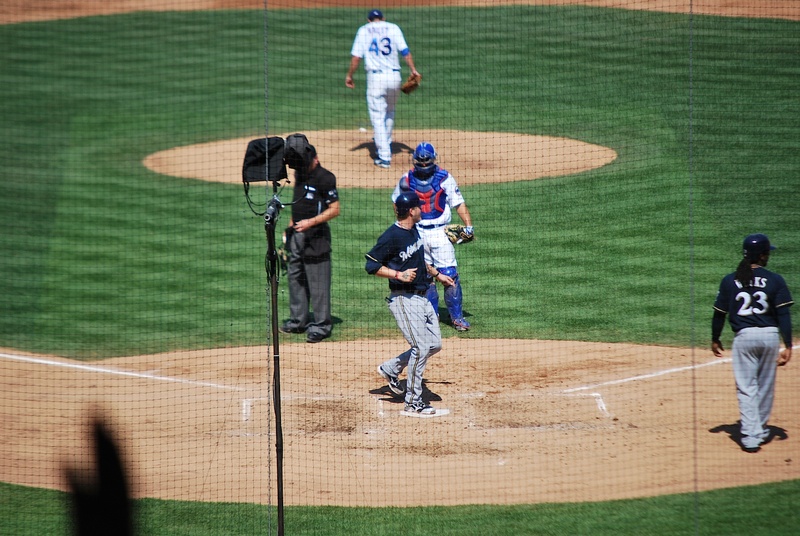 The pitching staff walked four batters in the inning and three of them scored. 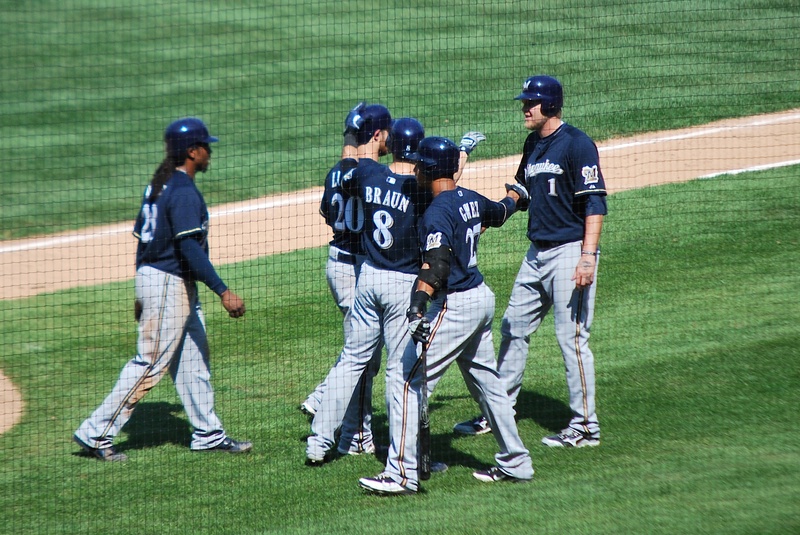 A Cody Ransom home run in the 7th and another RBI single from Lucroy in the 8th gave the Brewers an 11-9 lead going into the 9th. K-Rod came in for the save and struck out Joe Mather to start the frame. 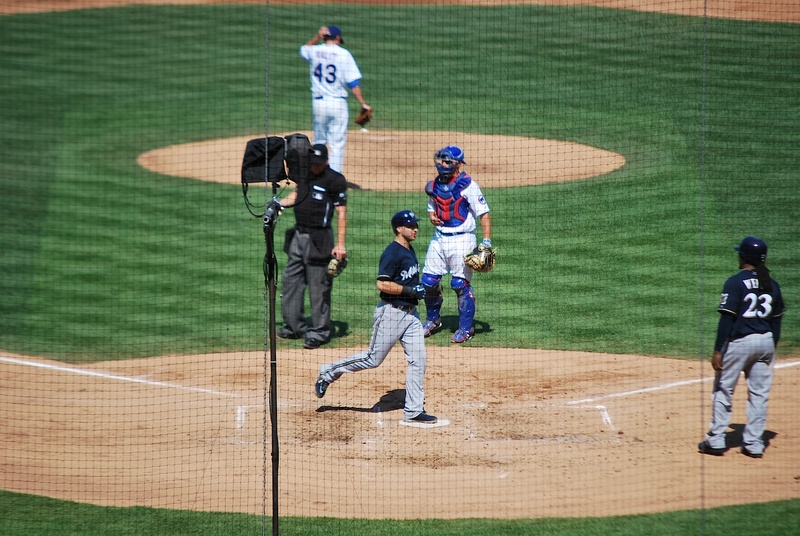 This is how the rest of the inning played out: double, walk, RBI single, RBI double, walk-off RBI single, game over. Final Score: Cubs 12 – Brewers 11. You’d think ELEVEN runs would be enough, but it wasn’t. 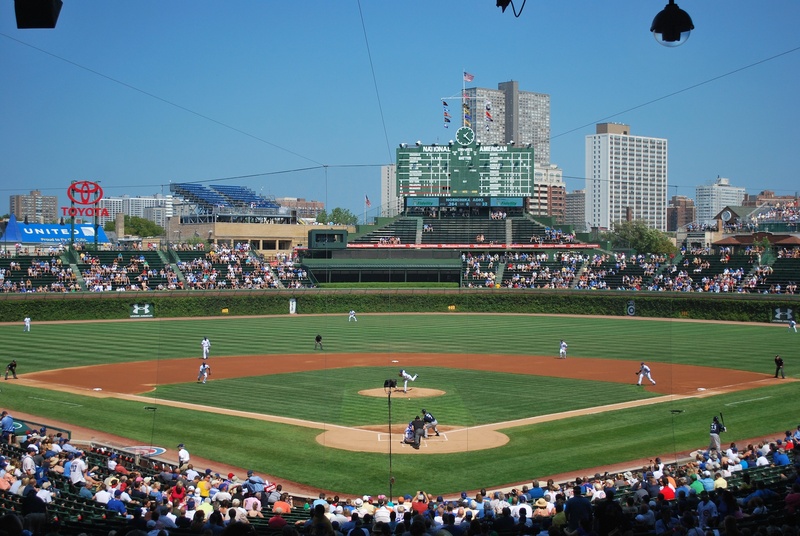 Honestly; all I could do was smile and laugh as I hurried out of Wrigley and onto the train. I’m past the point of being upset over late inning collapses, I’ve almost become numb to it. It’s sad but it’s better than getting super upset about it. The thing that I miss most about being on the road all the time, besides Victoria (that’s a no brainer), is home cooked meals. Alex did me a solid and made some Chicky Chicky Parm Parm for dinner. That’s a reference to the amazing mockumentary Parks and Recreation (on NBC). 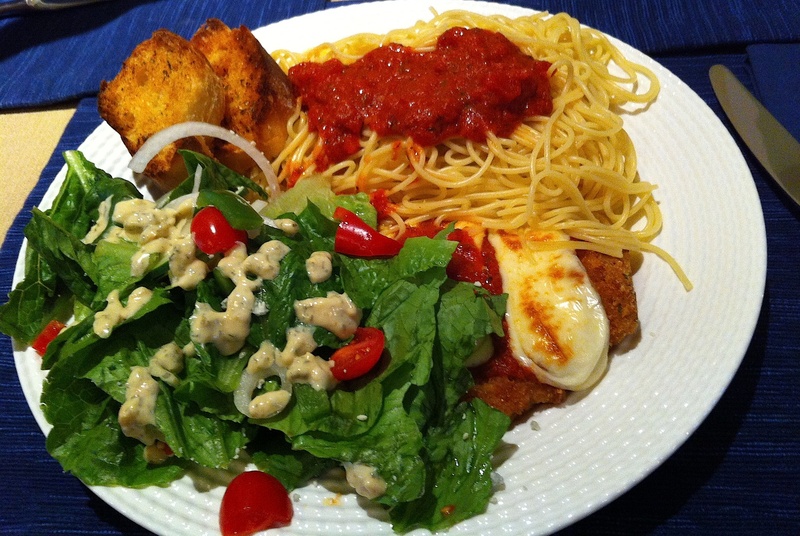 One of the characters (Tom) informs the audience what he calls certain items, Chicky Chicky Parm Parm is what he calls Chicken Parmeson. Long story short the meal was delicious. I can’t thank Alex and Jess enough for letting me stay at their place 12 nights this season. You guys are awesome! I got in my car at 8:15 and drove back to my parents’ place for the night. It’s past noon on Friday and game one of the Brewers-Pirates series starts in seven hours. It was all a big misunderstanding and apparently McCalvy had never mentioned my name. So when Kasper just saw a tweet from a random fan he thought he’d make a joke about it on air. Here’s how it transpired on TV. There were mentions of me at three times, so the video is spliced, otherwise there would be over an hour of footage. Thanks to Len for promoting Be The Match! I enjoy the blog – keep up the good work.